Those who know me personally or follow me knows it has been running since all this while or rather since I started a running about three and a half years ago. Riding was something an occasional affair and not very serious about in the discipline. 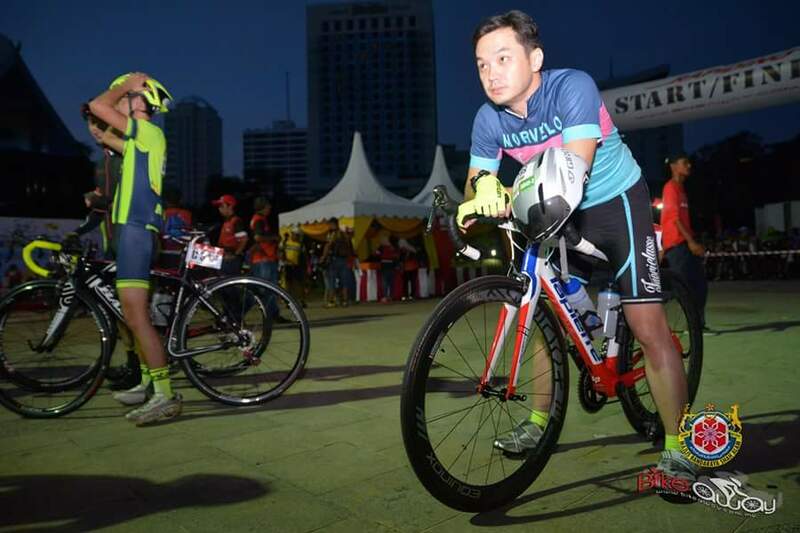 I rode only during triathlon or duathlon race, but not so on a cycling event. Hence, the longest I've ride was 90km during a race and a 50km ride as a training. Yes not ideal but that's me with cycling. Not riding regularly with a cycling group meant I went to the races alone without knowing any other participants but that's cool for me since the objective is to build up to the century mark and taking it as a hard training session. I had a small friendly chat before race start with 2 of the EZ Riders team cyclists (Bear and Andrew), they told me there were only 3 tough climb over the dragon back. I was like DRAGON BACK??? 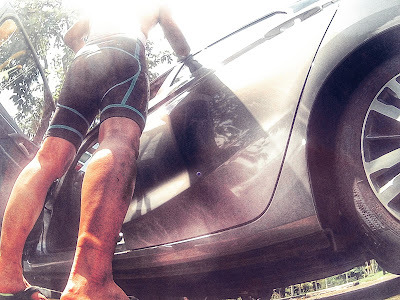 Although I have never run there before but I have heard enough elevation stories to stay away from it, looks like I have to face the horror after all and to make it worse on a bike which is a lot harder on the climb compare to running. Bear also asked me to be careful on the ride as there were many potholes and bumpy sections. For that I am greatful to the EZ Riders for the valuable advice going to into the race. Race started on time with a rolling starts mean no overtaking of the lead car until a certain pre-determined distance and within the couple of hundred meters Andrew and Bear was gone.. fast to say the least. As this is a new distance that I'm doing, I wasn't going to push for the entire race, as there are a couple of things I was set to test e.g. fueling, avg speed and threshold, so I started with a reasonable speed and gradually picking up my pace with the hope of sticking to a peloton that I can ride with as long as possible. It was rather uneventful for the 1st 20 KM apart from a narrow hard right where riders slow down considerably and clogged up the narrow junction. Nevertheless, most of the participants were seasoned riders and gave enough signals and space for everyone to negotiate through the turn. There were some rolling hills but because the legs were still fresh, it didn't give much of a problem for me riding into the 30km+/hr zone tailing a peloton. At KM 26, I saw the first big elevation climb and believe me it was very steep in my dictionary. Turns out, that was the 1st of the 3 big climb of the dragon back. Gear shifting was constantly at played, I was shifting no less than 10 - 15 gears from outer chainring to inner ones and rear cassette working hard to cope, balancing cadence and power along the steep albeit short climb. Clanging sounds was the only music heard from every riders' bike with such a climb. Luckily for me my quads were holding up to the challenge and managed to survived it. Being a runner instead of a seasoned cyclist, I was reasonably happy with my climb. Peloton breaks with climbs and after 2nd and 3rd, only a small group of riders were still sticking together and ride on. As the race unfold, at about KM 35 the first peloton from the Euduride caught up with me and zoomed past in a blink of an eye. I hope and tried to tail them but they were all too fast and I don't stand a chance. Not too long after, the road condition was deteriorating, what Bear has warned me earlier was really what it is. The road we rode turns into a bumpy ride and riders would occasionally weave in and out avoiding potholes that could send a rider up in the air or hitting the ground hard. It was dangerous to say the least, patch work can be seen every where and it wasn't fun especially on the down hill run. I had a near crash here on a down hill run at a speed of above 35km/hr into sandy patched due to construction work and uneven re-tarred sections. I had to hit the brakes hard and at the same time adrenaline rushing through my vain, I kept telling myself "please don't crash , please don't crash" and I was lucky enough to survived it. Seriously, I would not be surprised if someone crash. Although the organizer has the responsible to ensure the road are safe to ride, but I blame the city council even more for not using our tax money to make sure the roads are maintained well for any road users. The ride continue into the trunk roads with 2 or 3 peloton passing me at ease without me being able to response even I was averaging at about 30km/hr. Not all are bad, going over 30km/hr average was not part of the plan for my first race into this distance. Anyway, there were some welcoming sight along this stretch of the ride with kids from the villages coming out to cheer on the fast passing riders. That reminds me of overseas marathon races where the locals are really coming all out to give their best support, it is really a rare sight at home... a failure for not integrating sports into our country's culture, a RM30 mock cheque for the winner just don't cut it!!! At 90km final stop. My upper body starts to break down after battling tonnes of hill climb, I stopped briefly at the water/aid station and again at the road side just to do some stretching on the upper body. Soon enough another peloton ride past me and finally I was able to hang on into the 110km. I was damn glad the peloton came and pull me along for more than 15km into the last stretch of the race. At KM 114, my left quad had a small cramp but wasn't bad enough to stop, however it forced me to slow down for the next 2km just to nurse the left leg. At KM 118, a 2km before the finishing line going up a slight climb to a the final roundabout before home straight, my right quad froze up like a metal rod. Luckily, I managed to un-cleats the pedal before it locked up otherwise it would have been an embarrassing fall LOL. A young rider stopped and helped me with a massage and stretch and I'm greatful for his kindness and sportsmanship helping other fellow participant. 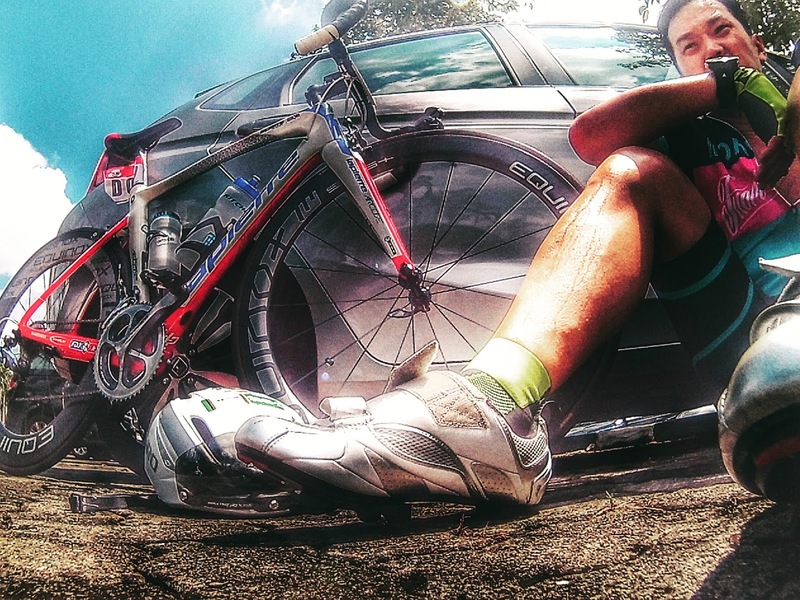 After all the dramas, I picked up the bike and rode slowly for the remaining distance. Crossing the finishing line was a big relief for me, albeit not meeting my target time, but I wasn't too far off. Without the bad cramp I'm pretty sure I will finished bang on the target. 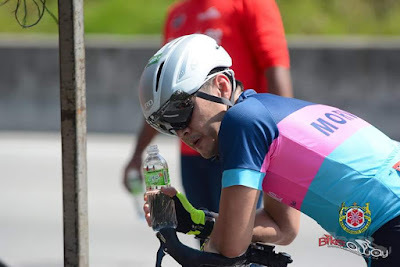 It was a good experience for me, I learnt that my fueling strategy didn't work out for me and the threshold was not too far off from what I have been anticipating, still there are lots of work to do for the century mark. Race was generally well organized, traffic control was reasonably okay apart from the town of Shah Alam itself otherwise it was fine. Water/aid stations were also spaced out pretty evenly at every 30km which works pretty well for me. The race course was a tough hilly ride, can't say I loved it to bits but it does give me a taste what lies ahead and how much I need to work on. Road condition, I'd give it a B- and a big D in caps for the bumpy and patchy section where I nearly crash. Saying that, to be fair to the organizer, it would be extremely difficult to find a smooth road for the whole 120km, so kudos to the organizer. Now that cycling is no longer an affair, does that mean you're divorced from running? But great job on your effort, man! You're getting stronger and stronger.